I make a handful of trips a year to the Vienna Beef Factory Store which also has a cafe for both of it's employees and also public to enjoy lunch. Of late they've always had a special at the deli counter on their turkey pastrami meat for $3/lb. So I've been buying it each trip in. I came up with a sandwich recipe that fit's perfectly with the pepper crusted turkey meat and would like to share the simple recipe with you here today. No exact measurements because you don't need them. You just need to know a good portion size and how to toast bread on a flattop. The first step is cooking the sliced red onion in a pan with butter until nice and browned. The butter is the key here folks, don't skip this step. The building of the sandwich is simple. Put the cheese on both the top and bottom. The onions go on the top followed by the tomato and then the turkey meat. Smother the top half with mustard and spread butter on both the top and bottom bun. Cook on a buttered flattop until golden and slice in half. Always hits the spot. When you love food as much as someone like myself does you can imagine the craves that can come for certain ones you love. One of my go-to comfort foods is anything involving noodles. I love them and can be satisfied whether it's a bowl of stepped up instant ramen or a plate of chow mein from the local old school neighborhood Chinese restaurant. So they're something I seek out and of course when I do pursue them I want more than what I previously described. I want something that I wouldn't be able to easily recreate and thus sometimes when the craves come it's the burbs or bust. It's been mentioned countless times on here how the big city suburbs are fast becoming the place for international eats. Chicago remains in transition and today I'll showcase five places I've tried in the last year, some more times than others, though all enjoyed at least once. Hope you enjoy the ride. I came upon this place by pure luck this winter. One day while tending to some business in the Western suburbs I decided to stop in at the Super H-Mart in Naperville and grab some stuff to cook with that week. Upon entering I saw a sign leading people to the food court and decided to go check it out. Score. I was rewarded with one of the best bowls of soups I've slurped this winter. Taiwanese Beef Noodle soup should be as well know as ramen. It may even be the next big food trend. But for the time being we Chicagoans have to make the trek out to da burbs for the best. Now there's now a second place I would recommend this dish aside from Katy's. Jia Jia Cafe's beef noodle soup recipe goes back 30 years with it's chef and that's most notable in the deep beef broth. It's spicy and highly addictive. The beef is tender to where it falls apart easily when poked with a spoon. The noodles are the weak link. I don't think they're homemade and they aren't as memorable as Katy's but this was still an exceptional bowl of soup and a great snack before shopping next door. Here's a spot I went to a while back, over a year ago. Why haven't I been back? I just haven't been out that way or if I was I didn't remember to stop back into this generically named gem sitting in a typical suburban strip mall. I was originally put onto the menu by Mike Sula who did a piece on it for the Reader. In it he mentions a few Malaysian dishes which they make and one of them is this popular stir-fried noodle dish. Char Kuay Teow Mae is typically made with flat rice noodles that get a nice char in the wok along with shrimp, soy sauce, sprouts, green onion, eggs and chili sauce. It's a comfort dish and due to Chicago's lack of Malaysian, one of the only places to try it is here. I'm a sucker for a fantastic rendition of beef chow fun but finding a good one is almost as hard as finding the final resting spot of Jimmy Hoffa. However this popular Chinese restaurant sitting in a strip mall has given new hope to finding the body. I've found that some places can do certain aspects really well while miserably failing to do other important steps in maintaining maximum flavor. No gravy for me please and the beef needs to be tender and give zero resistance. The noodles should be well browned and have a smokey flavor from the hot wok. The more green onion the merrier. Noodles Delight seems to accomplish all of that. We have a new BCF Champ. This place has been putting on noodle shows (Fri. and Sat. nights) for a long time now. Suburban families will flood the place on weekends when the staff is rolling out noodles made by hand to order. According to a story the Hungry Hound did on this place the noodles are considered lucky since they're made on-site everyday. With Chinese New Year around the corner you can expect Yu's to be packed when it hits. 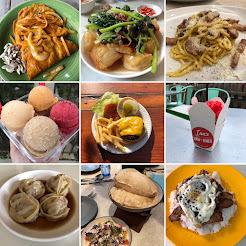 Diners have the option to try the house noodles in a stir fry or also the popular Ja Jeng Mien dish which covers the noodles in a soybean paste made from pork, onion and zucchini. I tried this last winter on a frigid cold day and it really hit the spot. Like bi bim bop and other popular story fry dishes it's best when mixed together so you get a little bit of everything in each bite. The chewy noodles would soak up the black bean sauce giving you a taste of the sauce in each bite. Here we have one of my favorite restaurants in the suburbs. I've been in love with this place since the first time I tried it after trekking out with a buddy to try the famous Ping's Chicken Wings. As good as those wings are (expect a full report sometime in the future) the noodles we ordered with them stole the show. Handmade and cooked to the perfect consistency to give them a little chew they come loaded with thin strips of pork, shrimp, scallops, squid, vegetables, chili peppers. One of the best deals in the city will get you change back from a $10. I've been running back for five years now. The Hat opened sometime around the end of last Summer. Upon it's opening I'm sure it caught many peoples attention as they were driving down Ashland, they put a large sign up. It's located at it and the intersection of North avenue directly across the street from the Hollywood Grill which is owned by the same people. They're giving folks the option of diner style food or Chicago style fast food throughout the day and late into the early morning (Open until 6a on Fri/Sat and 3a all other days). I stopped into here a few times since it's opening. Although I've stuck with just a couple items they offer all the Chicago style classics. I do want to give both the burger and the chicken sandwich a try but for now I've been settled in on the cheese fries, the hot dog and when warm outside I liked their banana shake made with fresh fruit. Come back soon Summer. On my first visit the loaded fries were pretty great. Taking the flavor profile of a potato skin they enhance standard frozen fries greatly by using Merkt's cheddar spread, sour cream and bacon bits. The first time the bacon was bits of real bacon but since then they've been actual bacon bits from the package. So they went down a notch but remain tasty. The dogs are offered steamed or charred and both are good though I prefer their char. Like me they cut them at the ends making the first and last bite the last. Stoned and sober The Hat works well for everyone in need of a quick Chi-Style eat. There's not much that we haven't covered over here. Seven years in S'C'&C is basically the largest guide of where to eat in Chicagoland known to man. Ok maybe not but we've documented 1000's of stops. However one area of the cityscape where my expertise isn't up to par with others would have to be the Bridgeview area. It's there where you'll find one of the largest collection of Middle Eastern restaurants in the Midwest. Quite a few have explored the area but I have the feeing that a few hidden gems have yet to be uncovered. Not today though, today's stop is a classic. For a while now Fattoush has been a favorite of many from around this way and even a few folks who post over at LTHforum. It can get packed on the weekends with family's celebrating something special or just having another night out. Luckily theres plenty of seating in the two room facility. Fattoush grills all of their skewers over live charcoal and has one of the best lunch deals around. For just $10 you'll get a skewer each of beef and chicken, two balls of falafel, grilled tomatoes and onion all on top of a large order of fluffy rice. Not done yet, they also throw you some hummus and a Jerusalem salad as well as a bowl of soup. This massive special makes for two meals. One of my favorites in an area that I promise to further explore as the weather warms up. See ya next time. Time for another quick trip thru one of America's once booming industrial towns. We covered Iowa with Sioux City, did Flint Michigan and ran thru Galesburg Illinois already so today it's time to head to Hoosierland. Kokomo had a natural gas boom in the late 1800's which attracted a heavy amount of industries. It's officially known as "the city of firsts" for a bunch of random things that were first made there, many of them food related. It was also an integral part of the auto-industry around the same time Detroit started to boom. Like most industrial driven towns it's seen better days although with events like the largest gathering of Ku Klux Klan members at the time (1923), there's lots not to be proud of when looking back at the city's past. Nonetheless I was passing thru and decided to seek out a few local favorites, without blending in. From the outside this looks like a shady neighborhood spot, theres abandoned buildings and torn up sidewalks on the block. The not being able to see inside thing never really screams come on in but I did anyway. Upon entering the tobacco smoke hit me the face harder than the first time I tried to smoke a cigar. Bunch of yocals at the bar so I decided to take a booth. The reason for my stopping here was to try a Lord Jon Taco which was a former local chain no longer in business. The same tacos they used to make there are now available here at the Handle Bar. What gives these a local cult following is the puffy fried tortilla shells used to make them, the rest of the taco is pretty generic as far as the ground beef filling and typical gringo supreme toppings. They're not San Antonio style puffy tacos but they're unique enough and made for a tasty cheap eat with a few cold brews. I googled "kokomo tenderloin" to see if there was a good spot in town to try one. Two kept coming up one and of them was closed so Ray's Drive In it was. While there were mentions of Ray's there wasn't much on it, just that they served tenderloins. I tried finding some info on them again here and still cant seem to find anything as far as their history. As I pulled in I noticed a sign that caught my eye and that can be seen in the picture below. Really? Well now I have no other choice. They also have a "normal" sized offering that can be ordered but you only live once has long been one of my motto's. So I told the lady behind the glass on the inside to put me down for one King Tenderloin. I shat you not when she handed me the bag I almost dropped it because I wasn't expecting to have to put any grip on holding the thing, it was heavy. It was also surprisingly thick and not beat down to the consistency of a front door carpet. It came heavily breaded with a crunchy exterior and some pretty juicy meat on the inside. I was surprised as it was more than a gimmick, it was actually pretty good. That said it's impossible to eat as a sandwich so I thought it would of been much better off topped with mashed spuds and gravy with a knife and fork by its side. This place has been in these parts since 1962 and with it being just a stones throw from Ray's their neon sign caught my eye. That was followed by the smells catching my nose which made for me having to stop in for a pizza to take home on the road. I saw it as a really good sign that the parking lot was getting packed with people coming for dinner and the "Our Crust is a Must" slogan on the sign really made me want to try them. I placed a to-go order in the old school takeout room where they make the pizzas to eat. I didn't get a snap of the ovens from another era but dug them and thought the pizza was pretty good too. I'm a fan of loose meat sausage and enjoyed their spicy blend but I've had better crusts. Note: The favorite of favorites in town is a bake from Louie's Coney Island which I already doc'd HERE. See ya next time. It seems like these days I get most of my local food news from DNAinfo. At least the news of new restaurant openings that don't come with a PR agency invite. So when I learned a former Kendall College student was opening his own sandwich shop in Pilsen I took note and went over to try it. Upon pulling up I rode right by Andorka's as it sits in an old house that to my knowledge wasn't a storefront from what I can remember. There is no sign but they do have a little specials board sitting on the sidewalk. It has the looks and feel of a place Potbelly would move into. Then upon walking inside it has the feeling of the original Potbelly on Lincoln avenue. The comparisons to Potbelly stop at the sandwiches. Andorka's bakes their bread in house giving you the choice of white or wheat. Upon choosing my sandwich choice the owner Matt was hand slicing a beautiful loaf of bread to get my sandwich going. The options are all pretty damn tempting when you consider that the ingredients are a step above the average sandwich shop. On this day I had a particular taste for a ham sandwich so thats what I went with though I'll for sure be back to try the pulled goat and also a roast beef. Back to the ham, it was wonderful. Along with very high quality ham this sandwich includes smoked cheddar, pickles and grain mustard. It's simple but so satisfying. One of the better sandwiches I've ate in sometime. This part of Halsted is slowly becoming a dining destination with Nightwood across the street as well as Del Toro and also Skylark down the street. Hopefully the neighbors understand that independent businesses are good for the neighborhoods character. Save the anger for when Quizno's opens up shop down the block. It's becoming harder and harder to find restaurant reports on places that aren't promoted by an agency. Maybe thats what the people want but it sure as hell aint what I enjoy when it comes to reading about food. I want to learn about the lesser known spots thus I should of had this post ready to go last year. That said when you're a one man team trying to tackle all the spots that get no pub love, it takes some time. Rapidito opened at least a year ago and seems to have fully found their groove. Their location on Diversey right near the Lincoln Park and Lakeview border seems to be working out well. Inside has the feel of a coffee lounge and Rapidito is always serving up Colombian style coffee for you to enjoy. I've seen people lounging with their computers on visits. If you're just looking for a quick snack while you sip your morning Joe try one of their excellent baked empanadas which seem to pack more flavor than the average version I've come across. Rapidito puts their own little touches on popular Colombian street eats. Some of the items might sound unappealing at first but once you bite into them you'll be sold pretty quickly. I know I was. My favorite bite to eat from here are the salchipapas. This popular street snack is found throughout Latin America. Typically made with fries and sausages mixed together with a special mayo based sauce. Rapidito takes theirs a step up with creole baked potatoes and quail hard boiled eggs mixed with smoked beef links. The mayo based sauce on the side is addicting. Hangover food for the gods. Another interesting option are the arepizzas. These are a breed of both arepas and pizza. Best described as a corn flatbread, they layer toppings on top as opposed to in the middle. The Hawaiian Oinker inlcudes pineapple, smoked ham, cheese, crusted potato chips and the signature pink sauce. Last but not least off the options I've tried is the Colombian hot dog. When you read the description it doesn't exactly scream "eat me!" however it's something you should try. In the land of the Chicago style hot dog this is an outkast that deserves a spot at the table. What the hell is on it? Fair question and since you asked I'll tell you. The toppings include Cheese, Pulled Chicken, Crushed Potato Chips, Ketchup, Mustard, Signature Pink Sauce, Honey, Pineapple Sauce & Hard-Boiled Quail Eggs. Sound gross? I promise it's not. Somehow in some way it all works well together. What's the one country that you just know, should you go, you'd be totally overwhelmed with the food? Mine is Japan. There's so much more to it than sushi and ramen. When we did a little izakaya crawl thru Toronto a couple years back I dreamed of the culinary journey that lies ahead of me when my time to visit comes. In the meantime I've been satisfying my winter craves for comfort food with some wonderfully easy Japanese recipes. So easy there is no set recipe to go with them, just a general idea for those lacking some inspiration for a quick 30 minute meal. Hope you enjoy. Is teriyaki marinated meat commonly ate in Japan? I'm actually not so sure but I do know we see our fair share of teriyaki chicken stands as you can find one in most any mall in America. Anyway this is more of a Japanese Hawaiian fusion dish where I marinate a nice piece of skirt steak for four hours or even overnight and then grill it up and eat it with eggs and rice. Easy enough and always a treat. As wiki states "literally buckwheat" and in this case it's made into noodles and stir-fried. This popular Japanese festival dish has it's origins from Chinese cuisine. It's very comparable to chow mein. When I go to one of the mega Asian grocery stores in the suburbs I like to pick up a couple packages of the yakisoba to keep in the fridge for a quick dinner. I'm actually partial to the fresh ones served in packs of three made by Maruchan. The sauce packet is addictive. All you need is some chopped sauteed vegetables, preferably the traditional topping cabbage for some crunch included and your meat of choice. Pork is most popular but chicken and bacon might be my favorite preparation of it. Not to be confused with tonkotsu ramen, this is the popular bento box eat of a fried pork cutlet. One of the simplest recipes one can make (google search will give you the basis) a tender pork cutlet gets bathed in S&P, flour, egg and tempura batter before being fried and then sliced. Serve with white rice. In our ongoing series featuring the specialties of the house at five different Chicagoland Mexican restaurants we visit the Northside, Southside and also the suburbs on this trip. Please feel to check out Part One HERE and then go read Part Two HERE once you finish this. Enjoy. Odds are most people living in Chicago couldn't tell where the suburb of Northlake is off the top of their head. But those that do know and have no ties to the area whatsoever most likely know about it through Pollo Vagabundo. I know they've seen their fair share of city folk since the amazing Mike Sula did a really nice piece on them for the Reader back in 2010. The title of the story points out how the trek to Northlake from the city is worth it once you start eating the food. For those still wondering the town of Northlake sits just 17 miles west on I-290 or just take Grand. There's a few really good Mexican restaurants and Pollo Vagabundo is one the one I'd recommend you check out first. As the name of the place suggests it's the grilled chicken that they specialize in but it doesn't stop there. Pictured up above is a beautiful display of some of the 15+ homemade salsas which the owner, Carlos Payan, makes for his customers to enjoy with his food. It's quite amazing actually. I don't know how he even remembers the recipes for each of them. You could call it the best condiment bar in the country and wouldn't get an argument from me. The grilled chicken comes perfectly cooked each time I've been in and including it with a spoonful of charro beans and some rice in a flour tortilla topped with a different salsa for each taco ate is my preferred way of eating this delicious bird. Carlos cooks up the flavors from his homeland, the state of Durango located in Northern Mexico. So you can also expect handmade flour tortillas, real deal Chihuahua style burritos made with those tortillas and also some really good specialty taco options such as steak and also chicken fajitas. You don't give a Chicagoland roundup of where to eat the best Mexican food without including this place. Hard to miss this when rolling down 26th street, the huge neon sign announcing "carne en eu jugo" is at least 15 feet in length however there isn't much on this place out there. I was surprised about that and tried it a while back after I found myself passing by and hungry. I ordered a bowl of CESJ and wasn't blown away by what I got but I did enjoy it. The broth could of been a little bit stronger and the steak a higher quality but I've had worse. Though they didn't bother me this order included tomatoes which I really didn't think it needs. Turns out one of my food circuit friends had been here and thought it was awful. However what he described wasn't what I got so maybe they got better and or have some consistency issues. Also of note is the tacos de canasta are dang good. I mentioned this great bowl of soup already in a SE staff special so I'm just going to quote myself again to remind you this is a great option this winter. "I'll throw out another great option. This one is found in Portage Park at an unassuming place called Pueblo Nuevo. While everything I've tried here, from the complimentary chips and salsa to the tacos, has been great, it's the bowl of pozole that keeps me coming back. They do a verde version with chicken that has a wonderfully potent broth that reaches maximum satisfaction when you add everything from the garnish plate into the bowl. Served Friday, Saturday, and Sunday, the $7.50 special can easily make for a meal for two." It's still good and may even be available all week though call ahead of time make sure, the tacos are Tour Approved. The Fox River Valley remains littered with great mom and pop un-yelped about Mexican spots and this one caught my eye with the mention of flour gorditas in the sign. I stopped in and tried one with beans and cheese. A nicely crisped exterior shell was complimented by a creamy inside. I enjoyed them the same way I do flour tortillas, great to have now and then though I prefer the traditional style. When riding down 63rd street I spied this new place located next door to Taco Villa. Upon further inspection I spied the sign and read they they specialize in both "Tacos de Ollita" and also Tacos Ahogados" the latter of which I've tried before but the former was new to me. After stepping inside I was greeted by the all in the family operation and complimented with a comforting bowl of fideo and also a basket of chips with a terrific warm red salsa that would be the start of a great meal. The tacos ahogadas come in orders of four. You get one ground beef, one carnitas, one bean and one potato with the order though I'm sure they'd let you mix and match if you asked. The tacos are fried to order and then just like a torta ahogada they get smothered in a light red sauce, chopped cabbage adds extra crunch. These are quite a treat and something I'll be indulging in when I'm near there. Then there's the Tacos de Ollita which I looked up online before entering but only found results of places in Mexico. So I don't think these are a specific regional style of taco like those above but rather tacos made with the family matriarchs signature guisados. At least thats what the options of them make me believe. You can try them with guisado de pollo, chicharron, papas, birria and others. I decided to try the guisado de pollo since it was the first one listed and also the choripollo since the combination of both chorizo and chicken sounded good. These also came topped with just cabbage and were served on el milagro tortillas. Each one was tasty with the guisado de pollo being dominated by the red chile sauce (I was asked if I wanted red or green) and the choripollo being what you'd expect as far as flavors. This place will be popular in the neighborhood.